Which is a better way for me to run, midfoot or heel striking? The answer is a definite and resounding, yes to either one. Currently there is no research that proves either is better. All we know is that faster runners in shorter events, up to about 10k, tend to run with either their midfoot touching first and in most cases then lowering their heel like applying an L-shaped piece of carbon fiber onto the surface for elastic loading. At slower speeds in distances over a mile, most runners heel strike first. Good runners also tend to heel strike when they run slow and long. The only thing we know for certain is that runners who habitually run shod (with shoes) and then learn to run on their midfoot, reduce the shock around their knees and this shock shows up as increased stress in their plantar fasciae and Achilles’ tendons as well as the calf muscles. Even when looking at middle distance runners, we notice that they are likely to start off running midfoot, and as they fatigue, they heel strike more. So what’s the difference between full foot, midfoot and heel striking? Few top triathletes are able, or should even try, to keep the heel completely off the surface. Good runners come onto their midfoot to sprint, surge or run in shorter races. Of the six elite U.S. men in the 2010 ITU World Championship Series Grand Final in Budapest, two were midfoot strikers and four were heel strikers. Land effectively. Place your foot on the ground, rather than just dropping it out of space. This entails accelerating your foot downward in a slight pawing move so that your foot is moving backward relative to your body just before contact. This will reduce shock and braking and provide you with a better pivot by having your contact point closer to your center of mass. This also will help minimize the quad-killing up-and-down motion in your gait. Try to land with your foot as close to flat as possible — too much toe in the air, with a subsequent slap from an excess heel strike is bad for your body and bad for your run. Roll your foot from heel to toe as if your sole were curved like a partial wheel. Similarly, do not point your toe downward and have your foot in an excessively plantar-flexed position either. If you do land on your forefoot, especially as a triathlete, be sure to allow your ankle to flex or spring load down sufficiently for the heel to take some of the put-down weight — don’t stay up on that midfoot throughout the stance/support phase. Imagine stiffening (but not locking) your ankle so that the arch and Achilles’ tendon can load like sprung steel or rigid carbon fiber in order to release this elastic energy milliseconds later in a release off the surface in toe-off. Pay attention to your shin. Whether you land on your midfoot or heel, if your shin is leaning rearward, even slightly, you are running with the brakes on — it has to be vertical at 90 degrees to the surface. All of the above are best learned through specific drills, rather than trying to tweak your gait while running. Increase your gait awareness while you run; even have someone videotape you so that you have a better sense of what you are doing. You’ll soon realize what’s least jarring and most kind to your body. By trying to run soft with good spring, you’ll bring in the elements that make best use of your legs; you’ll return to the feel of what your legs do most naturally, and that’s run! Cereal: here’s another popular breakfast item that has tons of sugar lurking beneath its surface. Only eat cereal that has no added sugar and contains some protein, healthy fat and at least 3g fiber. Drive Thru Breakfast Sandwich: don’t even think about heading to the drive thru for a quick breakfast sandwich.Instead grab a hard boiled egg from home to enjoy on your commute. Whatever your reasons may be, skipping breakfast puts your kids at a distinct disadvantage. And while you know breakfast is the most important meal of the day, approximately 40 percent of children don’t eat breakfast on a regular basis. Why do kids need breakfast? 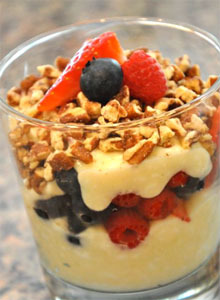 What are some fast, easy, and healthy foods to serve your family in order to get them ready for a good day? Keep reading to find out. Breakfast provides the fuel that is needed by all bodies to start the day. When your child wakes in the morning, his or her tank is empty and it is time to “break the fast” so to speak. Food gives the energy needed to function mentally and physically. Don’t believe it? Consider this: Studies have shown that children who eat breakfast before school perform better on their reading and math scores, have longer attention spans, visit the school nurse less frequently, and are better behaved in class. As if improved school performance weren’t reason enough to get your kids into eating breakfast, kids who eat a healthy breakfast are better able to get the daily nutrients they need. They are more likely to eat recommended levels of essential vitamins and minerals such as calcium; magnesium; phosphorus; riboflavin; folate; iron; and vitamins A, C, and B12. Breakfast-consuming children also have lower cholesterol levels. Some kids, especially teenagers, skip breakfast because they’d rather sleep in or because they think skipping breakfast will help them lose weight. Unfortunately, skipping breakfast to lose weight is a myth. In fact, those who don’t eat breakfast are more likely to have a greater body mass index (BMI) than those who do, since skipping breakfast makes kids so hungry they eat extra calories later in the day to make up for their skipped morning cuisine. Why aren’t your children eating a healthy breakfast each day? If it’s because your family is too rushed in the morning or you think you don’t have extra time to make them a homemade nutritious meal, it’s time to change your thinking. There are plenty of easy, fast, healthy foods to have readily available for your kids to grab and eat on the way. Any food is better than no food for breakfast, but healthy foods give your kids the energy they require to make it until lunch. A great way to knock out breakfast is to handle it the night before by hard-boiling some eggs. Hard-boiled eggs are a great source of protein and are fast and easy in the morning. You can also keep some small yogurt containers in the refrigerator for your kids to grab on the go. And of course, keep whole-grain bread, English muffins, or bagels on hand to toss in the toaster. You can also warm up microwavable oatmeal or let the kids eat cereal bars in the car. Keep whole-grain, low-sugar cereals on hand that kids can eat with low-fat milk or yogurt. And lastly, keep fresh fruit such as apples, bananas, and pears readily available to eat on the go. These are all nutritious options that are easy for moms or even kids to make themselves. So before rushing out the door tomorrow morning, make sure to give your kids a good start to the day. Fuel them up with a quick, healthy breakfast. They may not thank you, but their stomachs, minds, and teachers will. Healthy eating goes hand in hand with maintaining a consistent and challenging exercise program. Call or email me today to get started on one of my programs that will get you feeling younger and more energetic than you thought possible. 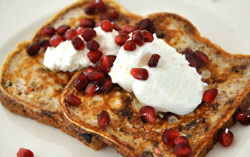 Just because you gave up white bread and sugar doesn’t mean that you can’t enjoy a delicious plate of French Toast! This recipe is made with sprouted grain bread, egg whites and protein-packed Greek yogurt. The whole family will love it. Dip each slice of bread in the egg white mixture, flipping to coat each side. Place on the prepared skillet and cook for 3-5 minutes on each side, until the eggs set and turn golden. Nutritional Analysis: One serving equals: 127 calories, 0 fat, 157mg sodium, 19g carbohydrate, 2g fiber, and 12g protein. The easy availability of low-nutrition snacks may contribute to childhood obesity in minority and low-income communities. In the study, researchers conducted more than 800 interviews on children in grades 4 through 6, from 10 urban elementary schools in which half or more of the students receive free or reduced-price meals. The study found that the most frequently purchased items were high-calorie, low-nutrition foods such as chips, candy and sugar-sweetened beverages. The study was supported by the Robert Wood Johnson Foundation through its national program Healthy Eating Research. This study is part of a larger national effort, the Healthy Corner Store Initiative, to help store owners in Philadelphia, Baltimore and Oakland, Calif., stock fresh fruit and other healthy snacks. If you’re feeling depressed or stressed then studies show that you’re probably going to overeat. And when you gain weight from overeating you’ll end up feeling more depressed and stressed. How is this vicious cycle broken? Find a consistent and challenging exercise routine. Alberto Contador was stripped of his 2010 Tour de France title Monday and banned for two years after sports’ highest court found the Spanish cyclist guilty of doping. The Court of Arbitration for Sport suspended the three-time Tour champion after rejecting his claim that his positive test for clenbuterol was caused by eating contaminated meat on a 2010 Tour rest day. The three-man CAS panel upheld appeals by the International Cycling Union and World Anti-Doping Agency, which challenged a Spanish cycling tribunal’s decision last year to exonerate Contador. CAS backdated Contador’s ban, and he is eligible to return to competition on Aug. 6. The ban means Contador will miss the Giro d’Italia, the Tour de France and the London Olympics, but he would be eligible to ride in the Spanish Vuelta, which begins Aug. 18. Contador had no immediate comment and is expected to hold a news conference Tuesday. He can appeal the verdict to Switzerland’s supreme court. The ruling came just three days after U.S. federal prosecutors dropped a doping investigation involving seven-time Tour winner Lance Armstrong. The American was a teammate of Contador during the Spaniard’s 2009 Tour victory. The revised list of champions shows Armstrong and Contador combined to win nine of the 11 Tours from 1999-2009. Contador blamed steak bought from a Basque producer for his high reading of clenbuterol, which is sometimes used by farmers to fatten their livestock. To avoid a doping ban, he needed to prove how the anabolic drug entered his body and convince the panel he was not to blame. In its ruling, CAS said the presence of clenbuterol was more likely caused by a contaminated food supplement than by eating contaminated meat. Contador is one of only five cyclists to win the three Grand Tours – the Tour, the Giro and the Vuelta. He also won the Tour de France in 2007 and 2009. He becomes only the second Tour de France champion to be disqualified and stripped of victory for doping. The first was American Floyd Landis, who lost his 2006 title after testing positive for testosterone. Andy Schleck of Luxembourg, who finished second at the 2010 Tour, stands to be elevated to the top spot. Contador kept racing after his positive test on a 2010 Tour rest day. He will be stripped of all results from his races since Jan. 25, 2011 – the day the Spanish federation proposed a one-year ban. That period includes his Giro d’Italia victory last season. CAS said it would rule later on a request by UCI to fine Contador $3.25 million. CAS secretary general Matthieu Reeb said the doping offense was ”not contested,” only the explanation for how the clenbuterol got into Contador’s system. If Contador appeals to the Swiss Federal Tribunal, the court can decide the legal process was abused but would not examine the merits of the evidence. A federal appeal process typically takes several months, though the court rarely overrules CAS. Contador tested positive on the July 21 rest day. The positive results were not confirmed publicly until September 2010, when the UCI announced it had provisionally suspended him pending an investigation by Spain’s cycling body. Contador was originally cleared last February by the Spanish cycling federation’s tribunal, which rejected a recommendation to impose a one-year ban. Days earlier, then Spanish Prime Minister Jose Luis Rodriguez Zapatero said on Twitter there was no reason to punish the rider, who is idolized in his country. ”It is regrettable there was some political interference at the first instance process from Spain which inevitably led to the appeal,” Fahey said. After the UCI and WADA appealed the Spanish verdict, a twice-postponed hearing was heard by CAS in November. The four-day session almost ended in chaos as lawyers for the UCI and WADA considered walking out when the panel chairman, Israeli lawyer Efraim Barak, prevented one of their expert witnesses from being questioned about the science of blood doping and transfusions. Contador attended the closed-door hearing, which ended with him making a personal plea of innocence to the arbitrators. The panel also included German law professor Ulrich Haas, nominated by Contador’s side, and Geneva-based lawyer Quentin Byrne-Sutton, selected by the UCI and WADA. The complex 18-month legal case also raised questions about the status of clenbuterol in anti-doping rules and the honesty of Spanish farmers. The drug is banned in Europe. Contador is under contract to ride in 2012 for the Danish team Saxo Bank. Team spokesman Anders Damgaard said the team was studying the ruling before making any comment. Team owner Bjarne Riis admitted in 2007 that he had used the performance-enhancing drug EPO during his career, including when he won the 1996 Tour de France. When it comes to fat, trans fat is considered by some doctors to be the worst type of fat. Unlike other fats, trans fat — also called trans-fatty acids — both raises your “bad” (LDL) cholesterol and lowers your “good” (HDL) cholesterol. If the label has hydrogenated oils, put it back. That is Trans Fat! Using trans fats in the manufacturing of foods helps foods stay fresh longer, have a longer shelf life and have a less greasy feel. You will find this mostly in packaged goods, so stick to the outside of the store and shop fresh whole foods instead of packaged food.